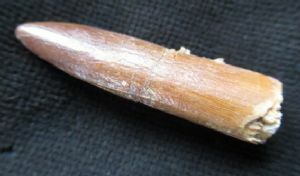 REBBACHIOSAURUS TOOTH - CRETACEOUS MOROCCO. Beautifully preserved Sauropod tooth. Complete to the very tip which is totally unworn (very unusual). Repair across the middle. A real top quality tooth. Tooth : 3.8 cm. long.